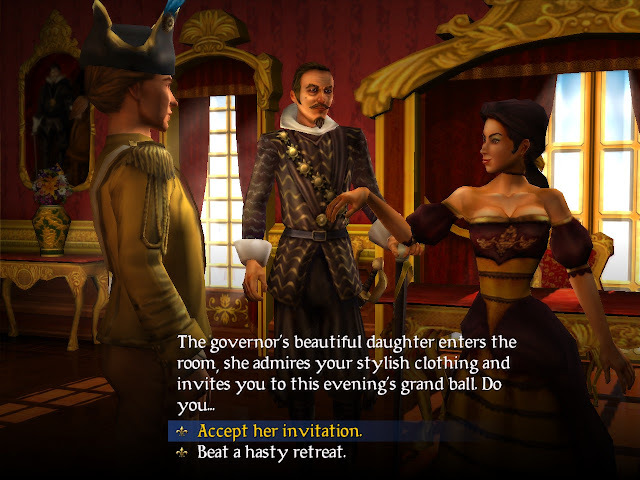 Meeting the governor's daughter in Sid Meier's Pirates! Urgh… I died a second time: the ship's hull exploded while I was refuelling. I was trying to find my way to a starbase in order to sell stuff since I had no credits and apparently, if you piss people off too much at certain stations, you're barred from trading with them ever again. This poses a bit of a problem when there aren't any starbases nearby and the only way to traverse between star clusters is through a warp gate (which requires you to pay a toll). If you're unable to pay the toll to get through the warp gates, I think you're stuck in the star cluster, forever! Seems a bit harsh and I think I've just about had enough of this game, I think it fits snugly in the "way-too-hard" basket. Okay I've now filled the whole map with districts and I'm now in the third era playing as a woman who is a medical scientist. I've never got this far into the game before as I've survived not only one election, but two. I'm trying to increase the density of districts now and while it seemed to work the first few times, it doesn't seem to be a very profitable venture any more. Also, it seems that adding services isn't really helping much except costing the city money. Finally, the Council is always asking to give the people tax cuts – like that would ever happen in real life 😉. As you can see, I've changed the "Percentage Complete" figure for this game since I believe I can gauge this more accurately if I just focus on which "Sequence" I'm at with respect to the game's storyline. Despite me thinking I was getting close to finishing the game, there's actually quite a bit more to do, it seems. I finally managed to capture a level 2 fort and also completed a mission where I had to go save Blackbeard's AAAAAARRRRrse (it wasn't me! My wife came up with the pun, honest! ;)). Before starting the mission, the game recommended I upgrade my ship and after getting impatient with grinding the requisite gold and materials to improve my ship, I ended up ignoring the warning and doing the mission anyway. It turns out the mission wasn't as difficult as I expected since I managed to sneak past all the ships and found my way to Blackbeard without being detected. So thankfully, I could ignore the warning about upgrading my ship for this mission, I just hope I'm as lucky in the future. I've played the game for a few hours now and there are a couple of aspects that are less than satisfactory. For starters, the music cuts out inexplicably every so often and I don't remember this occurring when I last played the game (which is several years ago now). Also, the graphics are starting to show their age: while the models are passable, the low-res textures, basic lighting effects and the inability to run the game at my monitor's native resolution is a letdown. However, in terms of gameplay, the game still holds up (thankfully). I love it how each side in the game has its own theme and I still find the Simlish equivalent that the characters speak, hilarious (apparently saying "TESSSST???" actually means something – it's definitely not the voice actor testing his microphone). I'm progressing well with the main storyline having rescued three of my relatives and I also know where Marquis de la Montalban's secret hideout is. What I can't believe is how spry Montalban is for an old man. Despite my character only being in his 20s, Montalban can often beat me to the thrust! I've also managed to woo a "beautiful" Dutch governor's daughter, in fact there are three levels of attractiveness would you believe: "plain", "attractive" and "beautiful" and it seems there is a strong correlation between attractiveness and the size of their *ahem* assets.